This card offers several enhancements over the standard GeForce GTX 680 including an 8 Phase PWM design, an 8+6pin PCIe Power Input and Vapor Chamber cooling. 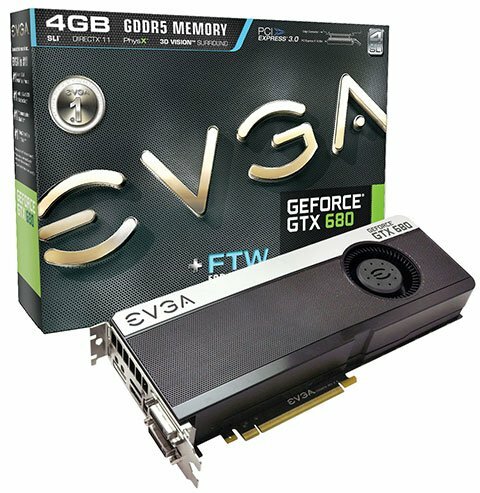 EVGA is also offering a version with 4GB of GDDR5 memory, so it looks like the 4GB cards have arrived! Both the 2GB and 4GB version of the EVGA GeForce GTX 680 FTW has overclocked base/boost speeds that are set to 1110MHz Base and 1176MHz Boost. The memory runs at 6008MHz (effective), which is not overclocked.